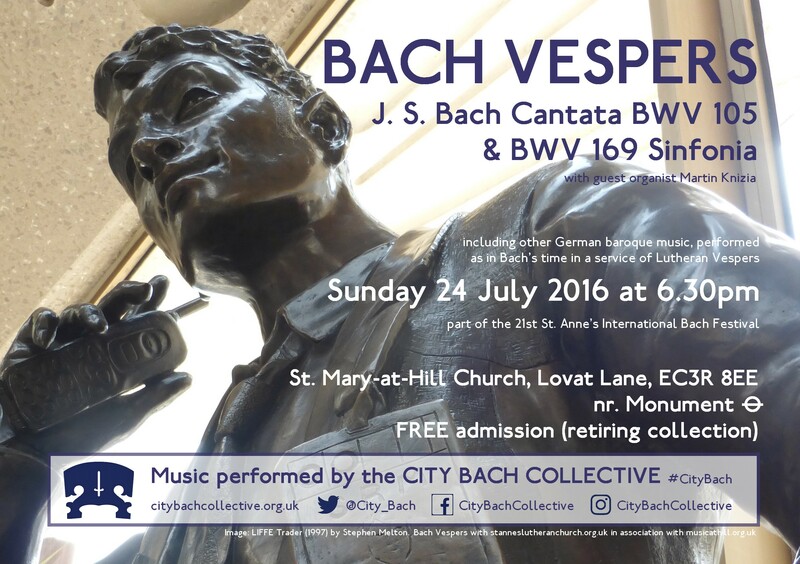 Almost a year ago I posted a mournful note to say that the excellent Bach Vespers series in St Mary at Hill was coming to an end, owing to the imminent departure of director Martin Knizia. As we know, a lot can happen in a year. * Following Knizia’s return to Germany, the singers and players of the Vespers series decided to keep the series going and so, 12 months on, the City Bach Collective go from strength to strength, continuing to provide excellent, pared-down and conductorless performances of Bach cantatas as part of a Lutheran vespers service. What this means is that you get not only an appropriate cantata for the Sunday but also related chorale preludes, plus motets and other music by Bach’s contemporaries and predecessors. The services are free (donations welcome) and are a fantastic opportunity to hear Bach’s sacred music in a context that he would have recognised. BWV 105 is a wonderful piece, not least because of the extraordinary closing chorale in which the agitated, restless figures of the accompanying instruments gradually become slower and calmer in line with the chorale text; it’s one of my favourite movements in all of Bach’s music. I really do recommend going along, to hear some excellent singing and playing – as an added bonus, Martin Knizia is visiting as guest organist – and to support these marvellous musicians in their dedication to continuing this fine tradition. *To be fair, a lot seems to happen on an hourly basis at the moment. I’ve finally managed to tear myself away from the never-ending news updates to write a quick post. Clearly the events of the past few days have been utterly momentous and have even felt all-consuming at times. Certainly, I’d be surprised if many of us are feeling particularly at ease right now, whichever way we voted. In turbulent – & divisive – times such as these, it’s easy to feel unsettled and adrift as we struggle to sort fact from fiction/opinion and try to get a handle on what’s going on and where things are heading. 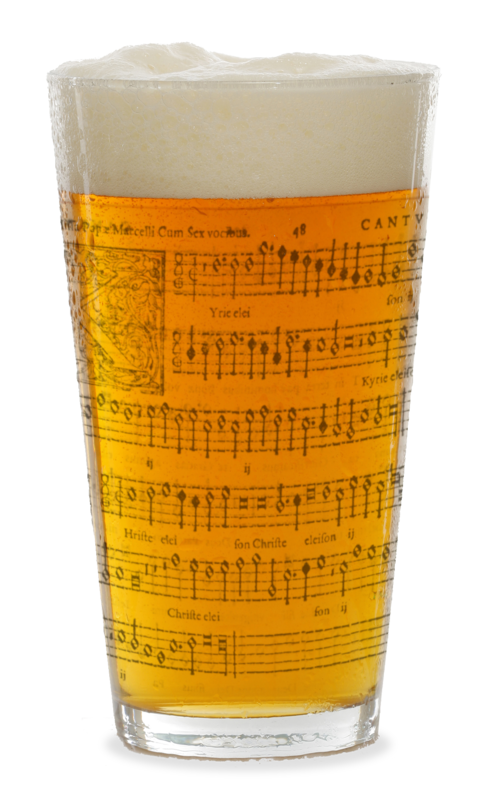 With all this sense of turmoil and upheaval, it might seem ridiculous to even mention our little pub-singing project. However, it occurs to me that PDtP, more than ever before, might now serve a small but useful purpose. After all, coming together to sing music of incredible richness and beauty in a spirit of fellowship and conviviality won’t be a solution to any of our woes – but I hope it might perhaps take our minds off them for a while. Therefore, please do come along to our Europe Special on July 11th, when we’ll be celebrating a continent’s worth of Renaissance masterpieces. Booking is open now. Before that, we will be holding another of our intimate Counterpint in the Cafe sessions at Travelling Through on July 8th. Booking goes live at 9am this Friday (July 1st); please only sign up if you know you can make it, as no-shows or late cancellations seriously upset the balance of voices. Finally, a reminder that PDtP will be up in Sheffield on Tuesday July 5th; there are some soprano/tenor/bass spots left (altos are all booked up) so do let any South Yorkshire friends know about it.